This chapter argues that the problems experienced during implementation and operation are in large part due to failings in legislature, discussing the role of ‘next-steps’ agencies, and how they moved the lines of accountability. 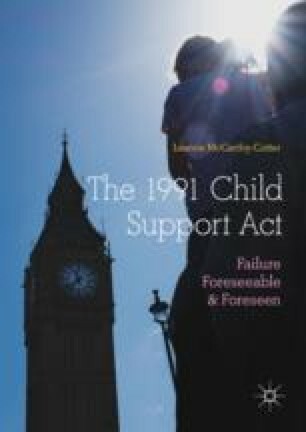 It argues that the use of ‘next-steps’ agencies distorted our understanding and appreciation of the failure that took place when the Child Support Agency was in operation. The chapter then provides the conceptual background to this study’s approach to implementation and its relationship to policy formation and policy failure. The chapter is brief, this is because it argues that what have typically been argued to be implementation concerns, such as those raised within the idea of ‘perfect implementation’, should be seen as stemming from problems at other stages in the policy process. The chapter argues that instead of using the idea of ‘perfect implementation’, the criteria of ‘perfect legislation’ should be pursued.